Kathy Tyers’ “Firebird Trilogy” – Faith, Humanity, and Conflict in the Far Future | J.W. Wartick -"Always Have a Reason"
Kathy Tyers’ The Annotated Firebird trilogy is an epic space opera spanning several planets as they are embroiled in an interstellar and cultural conflict. Here, I analyze the series from a worldview perspective. On my other site, I have offered a review of the trilogy. There will be SPOILERS in what follows. Throughout the trilogy, faith is front-and-center. The characters come from different faith backgrounds–Firebird is from a culture that worships the Nine “Powers”- essentially deified character traits; Brennan is from a people of exiles who have psychic powers and look to a coming Messiah from his line; others have no religious affiliation. This sets up a way to generate conflict among the characters but also have development. Firebird is confronted by the notion that the “Powers” she worships are ultimately impersonal and thus seemingly without any power. Moreover, she is intrigued by a system which is not based upon what she does but rather on the grace of a Holy God. It is a struggle throughout her conversion to accept this notion–that she herself does not need to do anything to earn her salvation. Her path of faith is one that is extremely interesting because it shows how the Christian worldview can come into dialogue with other religious traditions on a number of levels–on the level of salvation/soteriology; on the level of deity; and on many other levels. Brennan’s walk of faith is quite different as he was raised a believer. His character’s viewpoint is filled with brief prayers to the “Singer”–a primary name for deity in the book. These asides never throw off the pace of the book but rather offer ways for the readers to engage in the genuine faith of the characters therein. It’s also a call to believers to take their own faith lives more seriously. How often do we offer a brief prayer over some issue or of thanks throughout the day? How might we integrate our faith better in our daily walk? Overall, the picture of faith in the Firebird trilogy is one that expects truth in religious belief as well as evidence, confronts rival views in a compassionate way, and is lived out. Another major theme in the trilogy is that of human lives and the way they are often deemed waste. Firebird’s society is run by a monarchy and nobility which dominates all life and expects to be viewed as ruling with divine right. This is used as an excuse for devaluing the lower classes. Moreover, Firebird herself is considered a “Wastling”- one who is far enough back in succession that they are dedicated to serve until they die in combat or commit an ordered suicide because they are no longer deemed useful. This is, of course, an unjust state of affairs. It is one that must be confronted on a systemic level, and this is only beginning when the trilogy wraps up. However, I think the reader cannot help but reflect upon the notion that in our own society, we treat some people like “wastlings” to be discarded as unneeded and unwanted. We do not value human life as we should–as created in the image of God. Another aspect of this devaluing of life is found in the society of the Shuhr–a people who are the radical offshoot from Brennan’s own society. They practice genetic cloning and seek to make themselves immortal. The way they pursue this is through the creation and mutilation of embryos. Frankly, this disrespect of human life is little different from our own society’s, which allows for the murder of the unborn on demand. By putting this theme into science fiction, Tyers confronts our own worldview in a dramatic fashion. I remember when I was younger–probably about 12 years old–shopping a table at a book sale that was going on in the parish hall at my church. I saw the cover of this book that looked like science fiction and reminded me of Star Wars. I had to have it! There were three of them, a trilogy! I begged my parents and with some extra chores loaded on I received the books. I devoured them almost instantly, used Legos to try to build spaceships from them. I went to a Christian bookstore and demanded more science fiction from the author. The bewildered staff searched in vain to find anything else from Kathy Tyers. Without any more to read, I forgot the author but the trilogy entered that hallowed place of unassailable nostalgic bliss that we create in our childhood. Then, when I saw a newly released edition with notes from the author pop up in my recommendations on Amazon, I was instantly intrigued. Lo and behold, sequels were on the way! I purchased the trilogy again, but didn’t read it, fearful I would penetrate that nostalgic bubble and perhaps discover the series wasn’t as amazing as I’d hoped. Finally, after over a year of owning the book, I opened it up, read it, and now offered this look at the series. Check out my review of the book on my other interests site. 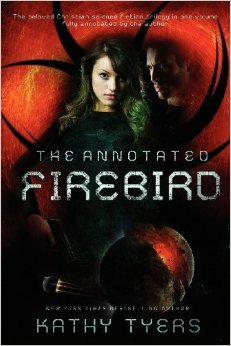 The Annotated Firebird is an excellent edition to pick up in order to experience the whole Firebird trilogy. It is a series which resonates strongly with the Christian worldview, but more importantly it does so without ever compromising on the story, world-building, or characters. Tyers has created a masterpiece. Kathy Tyers, The Annotated Firebird (Colorado Springs, CO: Marcher Lord [Enclave], 2011).